Habit: Annual < 40 cm; herbage sweet-scented. Stem: simple or much-branched; hairs short, glandular, or long, nonglandular, or mixed. Leaf: 1.5--6 cm, linear, entire or 1--2-pinnately lobed, generally glandular-hairy. 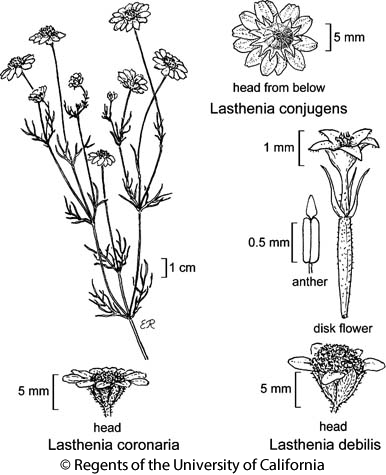 Inflorescence: involucre 4--7 mm, hemispheric to obconic; phyllaries 6--14, free, generally glandular-hairy, falling with fruits; receptacle conic, hairy. Ray Flower: 6--15; corolla yellow in alkali solution; ray 3--10 mm. Disk Flower: many; anther tip elliptic; style tips triangular or dome-shaped. Fruit: < 2.5 mm, linear to narrowly club-shaped, hairy, black; pappus generally of 5--6+ lanceolate to ovate scales or 4--5 oblong, truncate scales or 0, generally different in ray and disk fruits. Chromosomes: 2n=8,10. Ecology: Sunny, open grassy places, uncommon; Elevation: < 700 m. Bioregional Distribution: SCo, TR, PR, w D; Distribution Outside California: northwestern Baja California. Flowering Time: Mar--May Note: Only Lasthenia sp. with glands that produce a characteristic scent. Citation for this treatment: Raymund Chan & Robert Ornduff 2012, Lasthenia coronaria, in Jepson Flora Project (eds.) Jepson eFlora, http://ucjeps.berkeley.edu/eflora/eflora_display.php?tid=3730, accessed on April 22, 2019. No expert verified images found for Lasthenia coronaria. SCo, TR, PR, w D; Markers link to CCH specimen records. Yellow markers indicate records that may provide evidence for eFlora range revision or may have georeferencing or identification issues. Purple markers indicate specimens collected from a garden, greenhouse, or other non-wild location.